I had several snacks planned for my wine exchange, but I wanted one more thing that was a bit more substantial, and turkey meatballs sounded perfect. I found this recipe from the Spring 2012 issue of Real Food, a magazine from Lund’s and Byerly’s, given to my by Nate’s mother. I couldn’t find it on the internet to link back to, but I really didn’t change much from the original recipe. I was hoping for a lot more flavor in these meatballs. Unfortunately, they sort of fell flat for my taste. I normally use extra lean ground turkey, but I though I’d use just lean ground turkey, though I feel like the meat was too heavy for this recipe. I did bake them instead of pan frying them, and maybe not frying them in the peanut oil took away a little flavor that would have otherwise been there. If I make these again, I would certainly add chili sauce, too, but I didn’t want to this time around since I was cooking for several other people. 1. Pour boiling water over mushrooms to cover and soak for at least 30 minutes (up to 3 hours) to soften. Remove and discard stems and finely chop mushrooms. 2. Preheat oven to 400 degrees. Drizzle olive oil on baking sheet. 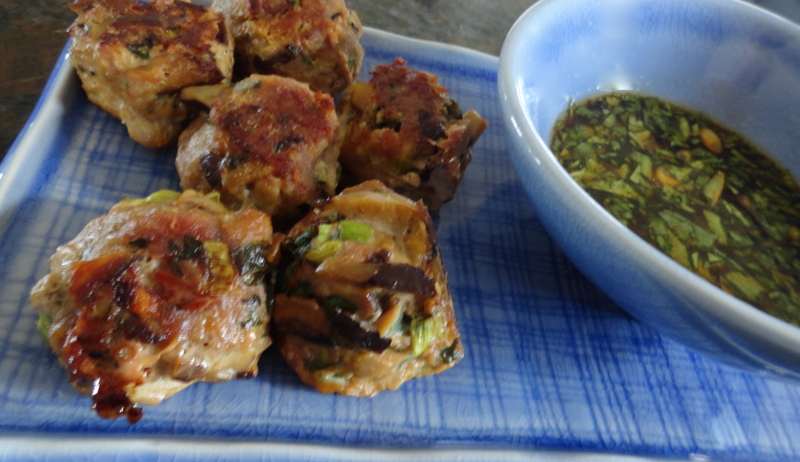 In a medium bowl, combine mushrooms, turkey, ginger, curry paste, fish sauce, sugar, egg, green onions, and cilantro. Fry up a sample and taste. Adjust ingredients as needed. Mix until well combined and form into 1-inch meatballs. 3. Place meatballs on prepared baking sheet, and bake for 22-25 minutes, until completely cooked through. Serve with Asian Dipping Sauce.